MayaInTheMoment here! Bringing you another quick, and easy craft! 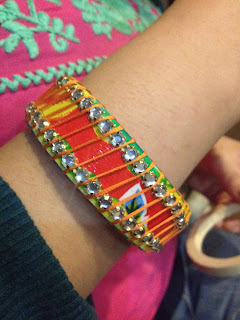 I've seen many types of DIY bangles lately, and I have bangles that I don't really wear too often(Frankly because they are plain..). So I thought, why not up-cycle them with something simple as yarn or thread? Let's get started! Add some bling with Tulip Crystals! Of course it doesn't have to stop there, how about sprinkling CraftyChica or Tulip glitter? Or adding charms? Here's a bangle my mom did. 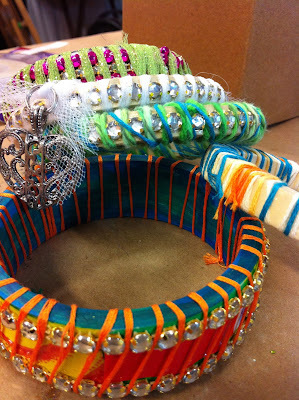 She used a wide wood bangle and added oil cloth fabric. These bangles are definitely going to turn heads! So try it for yourself, and go crazy! Awesome idea! And bangles are pretty cheap too. am a fellow Mixed media Artist/Instructor from PA.
Having stated that, if you purchase cheap christmas gifts from an established source it's possible you'll end up having a fake cheap omega watches that's so great that actually you'll find it difficult to believe a person didn't buy the genuine louis vuitton wallets , and it will last an acceptable time period too. It's not necessary to confess in order to anyone if you don't really feel you need to hermes bag outlet .